Immediately after arriving in the USA, to take part in this mentorship program, my roommate and I rented a car from our house owner. Our first time in the US, we are Europeans driving a European car, spending ten hours of each day in a facility where we have the pleasure to learn from great people and coaches, eat donuts, enjoy parties. It is all simply a dream come true. I met a girl and for the first time in my life, I felt butterflies in my stomach. Of course she never looked at me, but despite that I was really happy. I set a couple new PR’s. In the memoirs of my life, this period will be defined as golden age of the parasympathetic state. One day while driving the car we saw a yellow light turn on in the dashboard, and we started worrying about it for the next two days. I couldn’t go to physical therapy because of my right shoulder and left elbow pain, as we needed to bring the car to the mechanic. I was more concerned about the car than my own health. This is not wise, and unfortunately I know there will always be people who would have done the same. The next day I participated in beer olympics in our facility for the first time, including a beer bong and other funny disciplines. The day after beer olympics I tried to workout. While doing bench press at 70% of 1RM, it felt like one ton of concrete. Actually, during these days I was stuck in a sympathetic state. By the way, during these three months I am trying to balance between a sympathetic and parasympathetic state. Before this mentorship program I never wrote in English; it is not my first language. This is my second blog topic for the mentorship program requirements. During writing my first blog about velocity based training I was frustrated with everything I was producing. I even started to drink coffee for the first time. One day I drank a large cup of coffee around 3pm. That night, I could not sleep until around 4am. In short, I trained every day, some days twice per day, I started to drink coffee, I wrote stress inducing blog topics in English, and I usually measured heart rate variability (HRV) on a daily basis. Do you think any of this has affected my HRV? 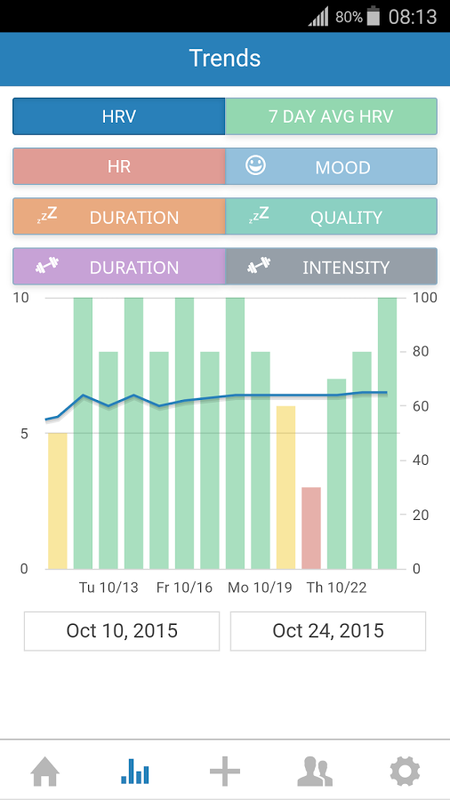 If you are wondering where I see a relationship between butterflies in my stomach, drunkenness with beer bong, stresses because of a car and other frustrations, and good and poor performance in the gym, lets step together into the world of HRV and everything will be more clear. By reading the texts of Marco Altini, Andrew Flatt, Jason Moore among others, my interest in HRV grew every day. Interests and timing, are the two main spices in my lifelong learning process. As I discovered multiple online articles and research papers, I was in a middle of the typing of this blog. Driven by the fact that I am still learning about HRV, this text will provide basic information and some of my thoughts about HRV. Almost ten years ago my father had a heart attack. Immediately after arriving in the emergency room, doctors start recording electrical activity of his heart with electrocardiography (ECG). Looking at the ECG report heart beats looks like waves (figure 1). Just as there are no two of the same hearts, every heartbeat is not at the same frequency (1), this variation in time (milliseconds) between successive heart beats represents HRV (2,3). From the coach’s perspective HRV is the double yellow line between subjective and objective monitoring of psychological and physiological stress level in your body. If you walk through the forest, and you meet a wolf or a bear, and have to defend yourself, your fight-or-flight mode turns on (sympathetic). During vacations at some exotic place, while resting on the beach each day, your are in rest-and-digest mode (parasympathetic). The purpose of this article is not to examine what someone would like more, to fight with the wolf or bear, or to drink cocktails on the beach and enjoy watching bikinis, because I think I already know the answer. Actually, I hope this text will motivate you to look into HRV science. Let’s try to imagine the Autonomic Nervous System (ANS) like a teeter on playground, on one side of the teeter is sympathetic and on the other side is parasympathetic. In a nutshell, stress caused by training is on one side and on the other side is recovery. During training cycles the teeter will move from one side to the other, the goal is actually to balance these two sides. HRV is an ANS-whisperer, it’s actually the objective result of a change on the teeter. Lower HRV scores indicate stress or fatigue of the body (1,3,5). Subjects showing higher HRV scores regularly indicated a better ability to withstand and recover from stress (3). With that in mind, these determinations are still situational. While this article will not discuss it, it is important to be aware that high HRV is not necessarily better and lower HRV scores are not necessarily worse (5). The sympathetic state is not hell and parasympathetic state is not heaven, or vice versa. Stress is necessary for adaptation, we just have to be smart enough to constantly balance between the two sides on the teeter. Literature provides information about HRV analysis in the time and frequency domain (2,4,7,8). Regarding the time domain frequently utilized measures include: standard deviation of normal intervals (SDNN), root mean square of successive differences (RMSSD) and the normal-to-normal (R–R) intervals that differ by more than 50 ms (pNN50) (2). Popular smart phone applications typically prioritize the log-transformed root mean square of successive R-R interval differences (lnRMSSD) (5,6). In favor of this parameter are several objective reasons why it seems to be preferable for athlete monitoring (5). Furthermore, among other reasons, this parameter reflects cardiac-parasympathetic activity (5,6). Two years ago, I started to measure HRV on myself and on the athletes I have trained. My experience is with the use of Omegawave Personal and Elite HRV. For this time, this was the right decision: invest my time to read and learn about this non-invasive biomarker, and the money to buy Omegawave Personal and Polar H7 heart rate sensor for using free Elite HRV phone application. I did not have to buy a smartphone because I already had one. If you are interested in measuring HRV, besides the experiences I have mentioned, by searching the web you can find many other devices and applications for phones. The purpose of this article is not to promote or compare any of the devices or applications for phones available on the market. As a strength and conditioning coach, I was more than happy to be able to track HRV, and by monitoring the current state of the athlete, I planned the next steps during the realization of the planned goals in the training cycle. If the baseline of my job during physical preparation is to improve performance and prevent injury of athletes, without precise individualization of training and objective monitoring changes on the ‘teeter’, the process of pursuing adaptations is the same as a trip to the unknown without gps navigation and no possibility to call for help in case I need it.